Adding to the stable of NCAA-themed sets, 2017 Panini National Treasures Collegiate Football clearly favors the high-end with the standard one-pack format. Of the seven cards in each box, six are some combination of autographs and relics. The seventh option in the box is from the 25-card base set, which also has Black (#/5) and Blue (1/1) parallels, as well as Printing Plates (1/1). The tight lineup focuses on the greats of college football. As most collectors are aware, NT caters to the hit chasers! 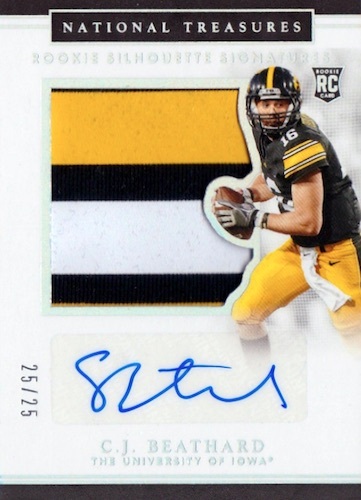 Although the 2017 Panini National Treasures Collegiate Football checklist has some sticker autographs, many sets are hard-signed, which is always the preference at this price point. The College Material Signatures subset highlights the 2017 NFL rookies in their NCAA gear. These have a jumbo relic to go with the on-card signature. 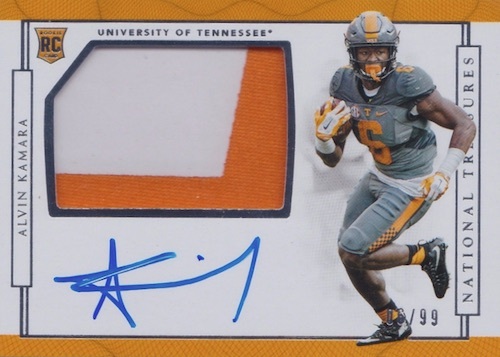 Other hard-signed first-year options include College Silhouette Signature with Team Logo Shield (#/5) parallels, and Combo Player Signature Booklet. The silhouette and booklet cards also have low-numbered Conference Logo, Bowl Logo and Championship Logo editions. Another staple, the Notable Nicknames set maintains its reputation for on-card signatures and added inscriptions. In addition, Material Signature cards promise game-worn college swatches, while Treasured Cut signature inserts honor Hall of Fame members from the NFL and college. There are also the Dual Autograph cards that rely on team connections between the players. 2017 National Treasures John Elway Collegiate Auto Autographs 8 25 Stanford!!! Shop available 2017 NT Collegiate Football cards on eBay. 25 cards. *Aaron Rodgers not found in Base. PARALLEL CARDS: Silver #/10 (Peterson - #/5, Manning - 1/1*), Gold #/5 (Peterson - 1/1*), Black 1/1, Blue 1/1, Printing Plates 1/1. All subjects not included in parallel cards. View specific options with the spreadsheet. 22 cards. Serial numbered #/5. PARALLEL CARDS: Black 1/1, Blue 1/1, Gold 1/1, Silver 1/1, Printing Plates 1/1. PARALLEL CARDS: Black 1/1, Blue 1/1, Gold 1/1 (Hyde - #/10*), Silver 1/1 (Hyde - #/25*), Printing Plates 1/1. *Elway, Manning, Staubach, Bradshaw found only in Base, Silver parallel cards. PARALLEL CARDS: Silver #/25 (McCaffrey - #/15*), Gold #/10, Black #/5, Blue 1/1, Printing Plates 1/1. 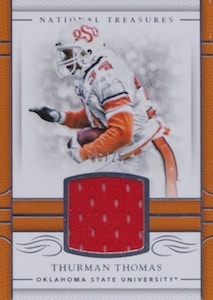 RED LOGO PARALLELS: Bowl #/10 or less, Championship #/5, Brand #/2 (Darboh - 1/1*), Conference 1/1, Team Shield #/5 or 1/1. PARALLEL CARDS: Prime #/25 or less, Bowl Logo #/10 or less, Championship Logo #/5, Team Logo Shields #/5, Brand Logo #/2 or 1/1, Conference Logo 1/1 (Reynolds - #/2*). All subjects not included in parallel cards. View specific parallel options with the spreadsheet. 3 cards. Serial numbered #/99. PARALLEL CARDS: Prime #/25 (Gallman - #/5), Bowl Logo #/5 (No Watson), Brand Logo #/2, Championship Logo 1/1 (Watson only), Conference Logo 1/1 (No Williams). PARALLEL CARDS: Prime #/25 (Peterman - #/10*), Bowl Logo #/5 or less, Team Logo Shields #/5 (Mack - 1/1*), Brand Logo #/2 or 1/1, Conference Logo 1/1. PRIME PARALLEL CARDS: Prime #/35 (McCaffrey - #/10*), Bowl Logo #/5 or less, Championship Logo #/5 or 1/1, Team Logo #/5 or 1/1, Team Slogan #/5, Laundry Tag Team Logo #/2 or 1/1, Brand Logo 1/1, Conference Logo 1/1. Pictures look awesome. Product looks unique. 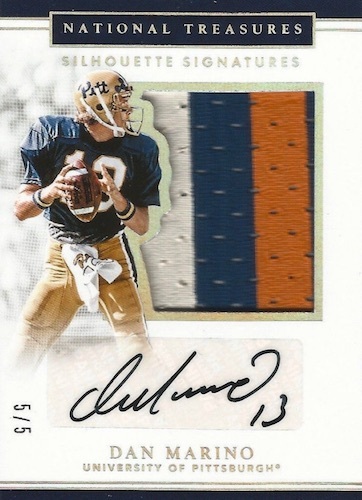 It’s very similar to Immaculate which can only make most of us hope these patches are different and not just the other side of the same logos. Otherwise Panini did well. Haters will hate, but complaining doesn’t show anything other than lack of experience. 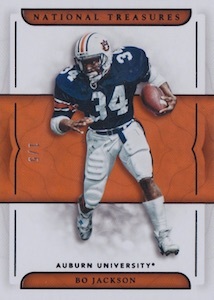 The production teams at Panini work hard to give collectors what they want. For the above comment, it’s a high end product, no need to complain if it’s outside your budget.